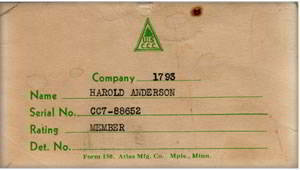 Harold Anderson was born November 3, 1912 in Renville, Minnesota. He was the son of Mr. & Mrs. Peter J. Anderson. His home address at the time of enrollment is listed as Redfield, South Dakota. 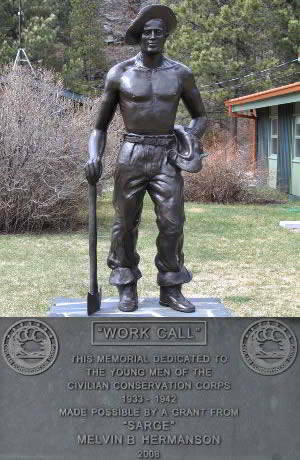 He attended school at Beresford, SD and Clark, SD. He was a butter maker for a short time in 1933 at Baldwin Cream located in Clark, South Dakota. 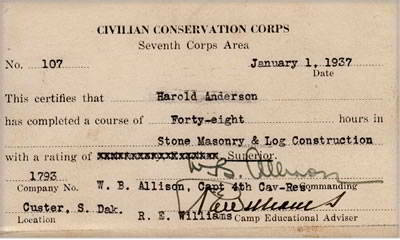 xInformation collected from enrollment records provide to the Civilian Conservation Corps (CCC) Museum of South Dakota by Morris and Barbara Anderson. Morris Anderson is the son of Harold Anderson.